Members of the Portakabin thought it would be a great idea to utilise our volunteering day by partnering with York Cares and taking part in their ‘Big Community Challenge’, where we were joined by other businesses and volunteers across the city to refresh Hull Road Park as a hub for the community. As we set off we were driving to the Park in the pouring rain, praying for some sunshine, or at least that we would be in a nice warm room, painting or something similar to keep us warm and dry, only to realise that the rain wasn’t going to stop and the only tasks left to do were outside! 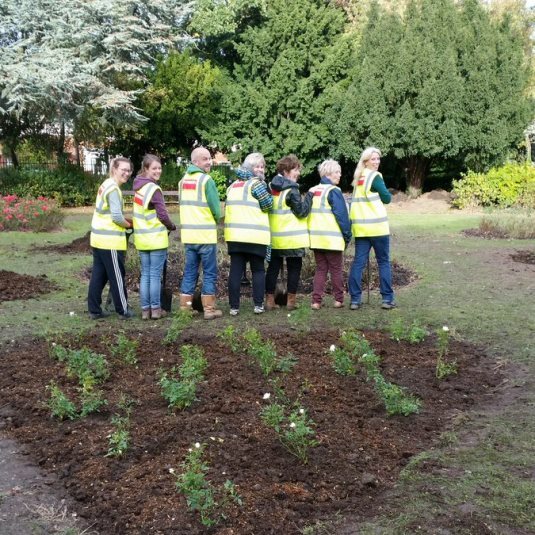 But we need not have worried, the York Cares staff gave us a warm welcome and a cup of tea to get us going before heading off to regenerate the park by building pathways, planting shrubs and flowers and generally making the park look presentable. By the end of the three and a half hours the sun was shining, we had managed to do what we set out to achieve and the park was looking fantastic. This was the first time I had been involved in something like this and it felt good to be outside, speaking with people who I’d never spoken to before, even within Portakabin, and to be contributing to such a great cause. We all felt a real sense of achievement by the end of the day and are keen to get involved in more community activities.